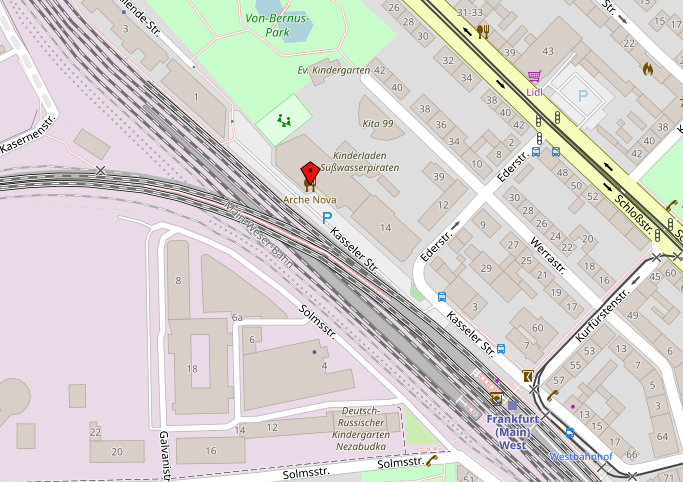 ISIS is located in a building called “Ökohaus” in Frankfurt/Bockenheim. It is next to the “Westbahnhof” train station. There is a small creek running through the glass-roofed lobby of the Ökohaus. Follow it upstream until you reach its source. On the right hand side, a glass door leads to a staircase and elevator. ISIS’ offices are on the 4th floor. Take one of the following S-Bahn (interurban commuter train) lines from Hauptbahnhof (Frankfurt Central Station) to Westbahnhof (3 stops). Get off at Westbahnhof, leave the station and turn left into Kasselerstr. You will approach the Ökohaus directly. There are two different train stations at Frankfurt Airport: the Regionalbahnhof (Regional Station, located in Terminal 1) and the ICE-Bahnhof (Long Distance Station, located outside of Terminal 1). Go to the Regionalbahnhof and take S-Bahn lines S8 or S9 in direction of Offenbach or Hanau and get off after 3 stops at Hauptbahnhof (Central Railway Station). Then follow the directions explained above. For detailed schedules and fares for S-Bahn (regional trains), U-Bahn (underground), Straßenbahn (tram) and busses, please see www.rmv.de which is also available in foreign languages. Please use an online route planner to find the most convenient route. The institute’s premises are located in Frankfurt/Bockenheim which can most easily be reached by two motorways: the A66 (northbound), use the ‘Miquelallee’ exit and the A686 (southbound), use the ‘Opel Rondell’ (or ‘Frankfurt West’) exit. Both motorways connect to the A5 west of Frankfurt/Bockenheim. Further information is available by searching Stadtplan Frankfurt on any search engine. There is a charge for the car park in front of the Ökohaus. Parking for people with disabilities is available.